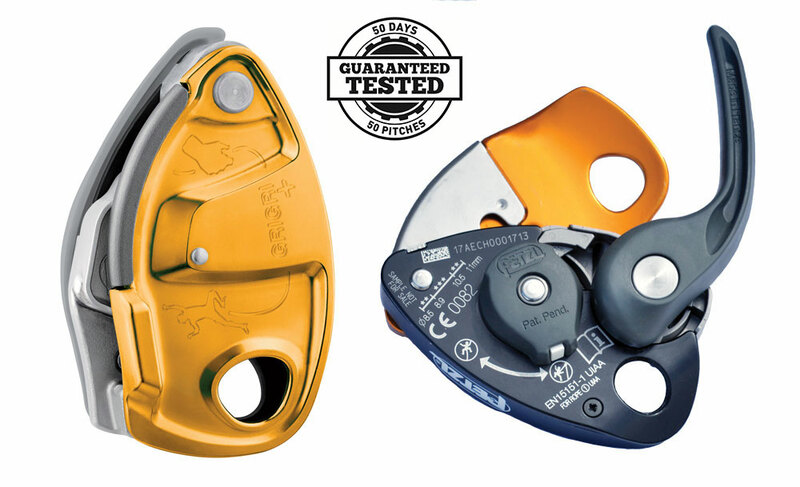 Field test review of the new Edelrid Mega Jul belay device, a serious contender for a “semi-auto” device. The Edelrid Mega Jul comes as close to being a do-it-all, one-stop-shop no-drop belay/rappel device as any I’ve ever seen. This multifunctional tube-style device is super light, feeds slack to a leader much more quickly than other devices in its category, and can be used in a number of different configurations that increase its braking power to a degree on par with mechanical auto-locking devices. Two observations: First, I recommend using belay gloves, especially for lead belays, since you can get a rope burn on the crease between your thumb and palm when using the device in Thumb Mode. Second, because this device can be used in so many configurations, I found it initially confusing. The instructional graphics on the side of the device didn’t really help, either. I had to dedicate some time to memorizing the way the device worked in order to not fumble around with it out in the field. During a month-long learning curve I was 50/50 for loading the device wrong when belaying a second from above. The Mega Jul weighs just 65 grams and can be used for double or single ropes from 7.8mm to 10.5mm. I only tested ropes in the 9.1 to 9.8 mm range. 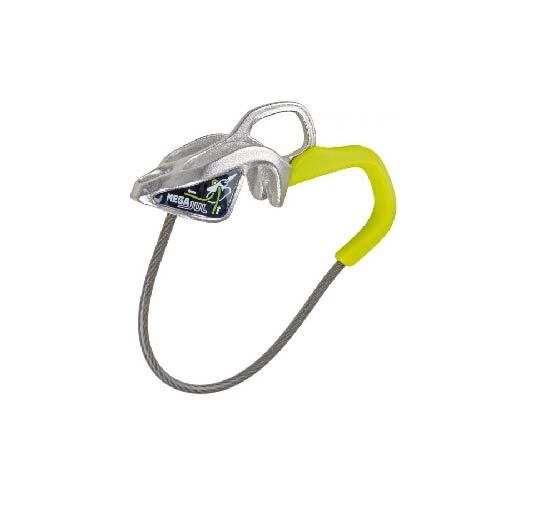 Edelrid is also making a sister device, the Micro Jul (not tested), that weighs 60 grams and is meant for half ropes in the 6.9mm to 8.9mm range. The Mega Jul’s most distinctive feature is plastic green U-shaped bend in the device’s cable. This “thumb loop” is primarily used during lead belays. Load the rope into the device such that the thumb loop points away from you. Hook your hand underneath the thumb loop as well as the rope so both are sitting in the “basket” between your thumb and palm. In this configuration, you never have to take your break hand off the rope. Feeding slack is accomplished by lifting the thumb loop (and rope) up away from your body. Pull slack with your guide hand (left hand) and the rope feeds through the device much quicker and more easily than with other tube-style belay devices. It feeds almost as quickly and easily as a Grigri 2. 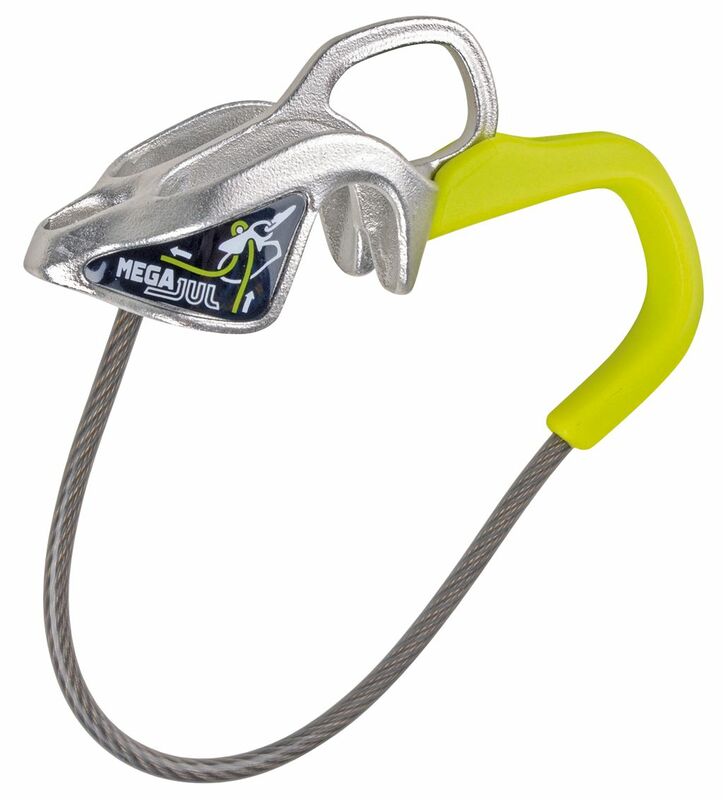 Best of all, the Mega Jul locks down on the rope in the event of a fall because the locking carabiner pinches the rope into a notch in the device. I know companies today shy away from the word “auto-locking” but Mega Jul certainly does a great job of braking a fall with very little effort. The type of locking carabiner you pair with the Mega Jul is important. I tested it with the Edelrid HMS Strike Screw FG, which can be purchased with the Mega Jul as a package for $49.95. I tried using the Mega Jul with other locking carabiners of various sizes, and it didn’t quite work as well. Carabiners of thicker diameters performed better, but thinner carabiners allowed rope slip. To lower a leader after a fall, there are two options—neither one fantastic, representing the biggest shortcoming with this device, but both get the job done. One: use the device in Thumb Mode by pulling the thumb loop and rope away from the harness, this time with your left hand, and controlling the descent with your brake/right hand. Again, belay gloves are a must. Two: Lever Mode. Hold the rope with your brake/right hand when preparing to lower a climber, and use your left thumb to push down on the part of the device that looks like the tip of a nose, which releases the break on the rope. I found Lever Mode preferable. Like most other belay/rappel devices on today’s market, you can belay a second from above with auto-blocking capabilities. Initially, I had a tough time with this mode because my natural instinct was to clip the device to the anchor from the thumb loop—not correct! You clip through the metal loop just beside the thumb loop. I also got confused about which direction to put the bite of rope through the device. Once I got it sussed, however, I could put a second (or two seconds) on belay quickly. Another great feature is that if you need to a lower a second in this configuration, you can clip a third carabiner through the small hole at the “nose tip” feature and use that as a lever to release the auto-block. This gives the Mega Jul a huge advantage over most other autoblock devices, which require more fiddling and backups. The Mega Jul is the lightest, most versatile and best-performing all-around belay device I’ve ever used—once you get comfortable with it. • Weight: 65 grams. • Tube-style device for Single, Twin and Half ropes. 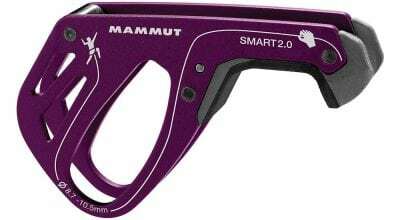 7.8-10.5mm • Assisted breaking for lead belays and belaying seconds from above. • Assisted breaking on rappel in Locked Mode.